Being a mom hurtles you through time at a speed that is impossible to put into words. 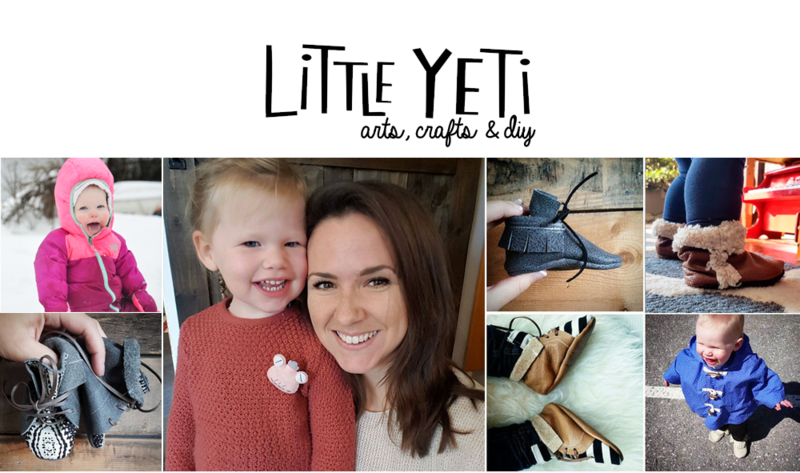 Here I sit, writing a blog post about my now three year old's birthday party. How did this happen!? Luckily for Juliet, unicorns are pretty trendy right now. 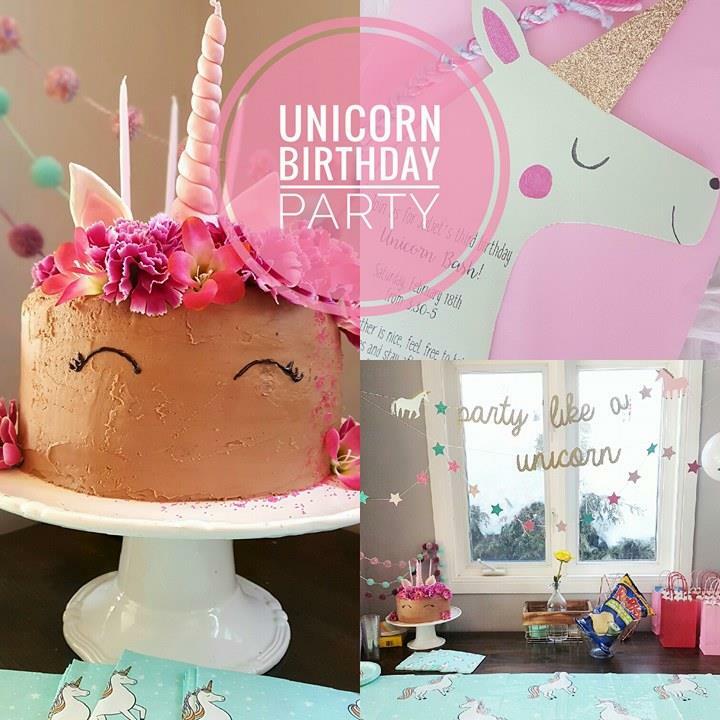 There was no shortage of unicorn ideas on the internet to get our creative juices flowing. I'll break down a few of my favorite unicorn ideas we used for her party over the next few days. Unicorn cakes are everywhere. 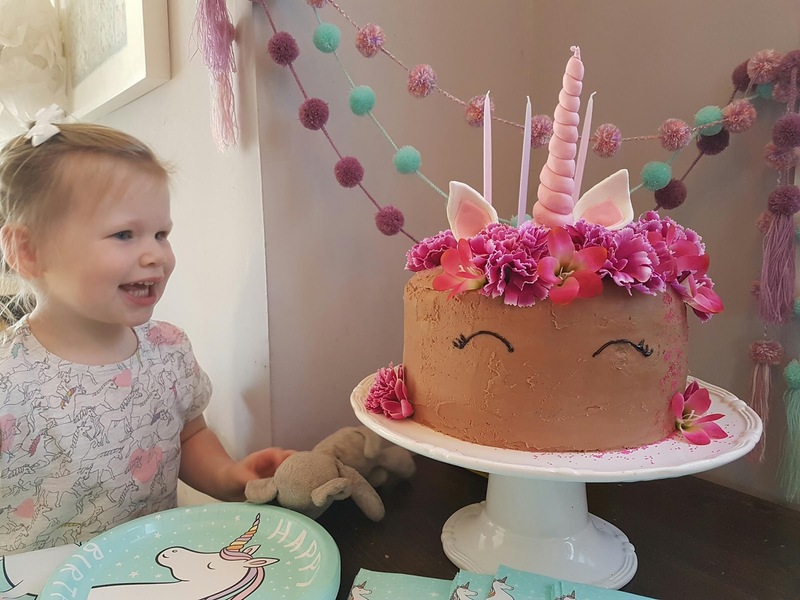 These cakes look daunting, but are actually extremely easy to make.With a few simple tricks I promise you, you can make a great looking unicorn cake too! Before baking the layers, I separated the mix into 4 bowls and dyed three of them (pink, blue and purple). I swirled the colors together with the white mix, to get a cute marbled effect that I of course forgot to take pictures of upon cutting the cake. 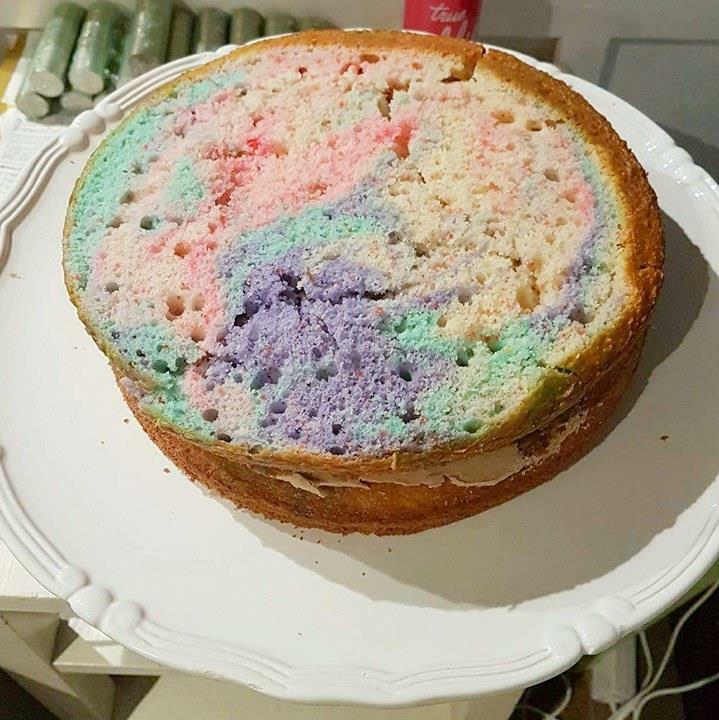 Have you ever built a layered cake before? If not, the main trick is to let your cakes cool completely, then slice the tops off flat so they don't make a dome when they are stacked. That being said, I am in no way qualified to explain this whole process to you. Google is your friend. Aren't the swirls pretty?! It looked even cuter when the cake was cut. 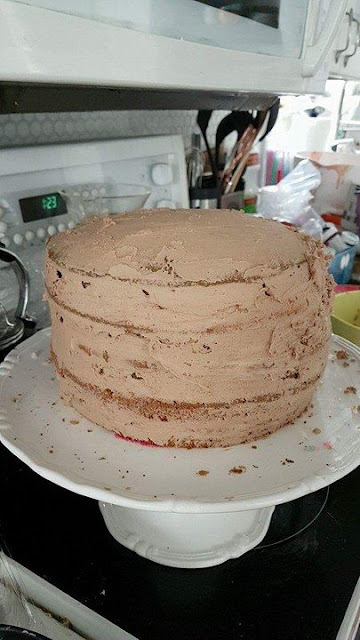 In between each later I slathered on buttercream, then when the cake was fully built, I did a crumb coat. taste it. If it needs more Nutella, add more. After the crumb coat sits for 30 minutes, slather on more icing until the cake is smooth. The horn was made using fondant. It's a skewer with two snakes of fondant wrapped around it. When making the snakes, have them get skinnier on one end. Then the skinny ends will become the top of the horn! The ears were fondant rolled flat then cut into triangle ear shapes. The pink inner ear was attached to the white outer ear using a dab of water, and stuck into the cake using skewers. Once you've stuck in the horn and ears, use an icing pen to draw on some eyes, and you're done! My daughter LOVED the cake. I kind of can't believe how simple it was to make, especially since the payoff was so great. If you're on the fence about making one, I really recommend giving it a shot. And if you find a 6" pan anywhere, hit a girl up, because this cake was huge. 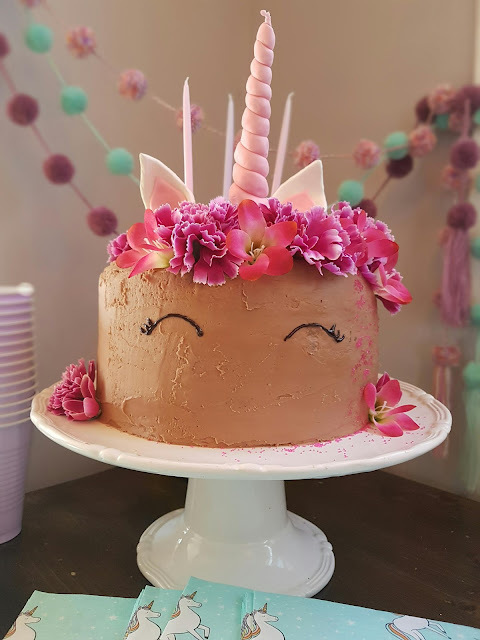 I'll be back soon with more of the unicorn projects we did for her party! Have you tried this project? If so, let me know in the comments! Target!! You can order online to Canada too and the shipping isn't actually that terrible because they have a $20 off your order of $100 or more coupon. That cake is Adorable!! I love the fresh flowers on it too! This is the bomb. Thank you for sharing this! 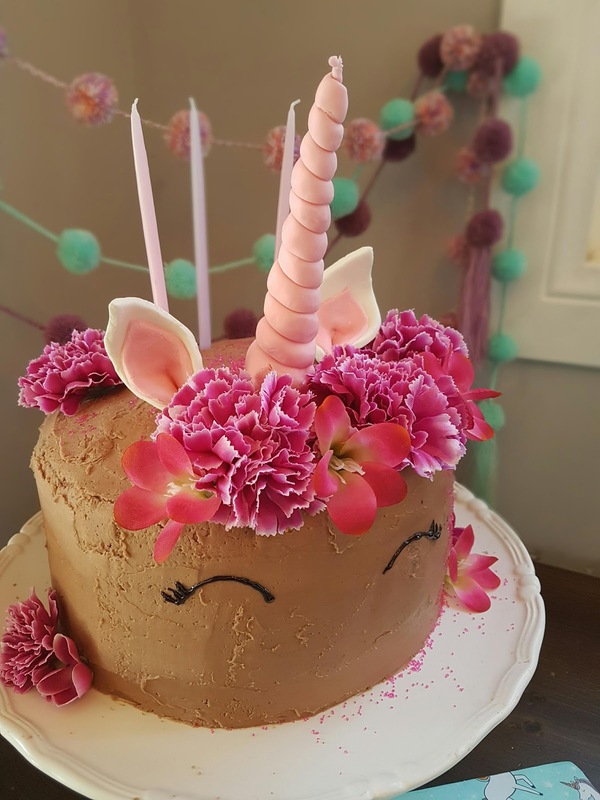 I've been pouring over unicorn cakes online for my daughter's birthday coming up, and this is seriously my favorite take on it. Simple. Relatable. And inspiring all the same. Thank you! Brilliant party décor! Will make all possible efforts to make the engagement ceremony of my brother memorable. Saw many venues in Los Angeles online and will book the vintage interior one. Need perfect parking space with amazing garden area too. Floral orders will also be done online with caked, cup cakes and party souvenirs.